Chinese Medicine for the Fall Season | Henry Jun Wah Lee, L.Ac. In the Fall season, leaves change color and fall, seeds dry up, and the sap of trees goes into their roots. This is a time of harvest, a time to start organizing the scattered patterns of the previous warmer seasons to gather – food, energy and protection — for storage ahead of the approaching winter. 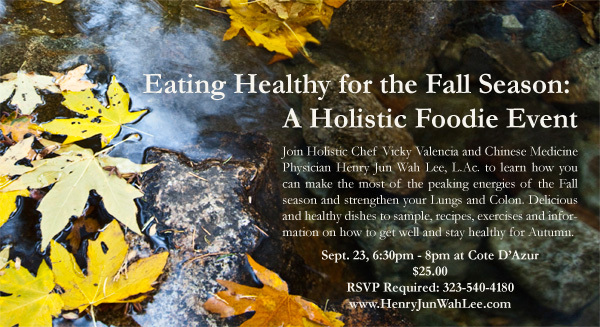 Join Holistic Chef Vicky Valencia and Chinese Medicine Physician Henry Jun Wah Lee, L.Ac. to learn how you can make the most of the peaking energies of the Fall season and strengthen your Lungs and Colon. There will be delicious and healthy dishes to sample, practical recipes you can use, exercises you can practice, and enlightening information on how to get well and stay healthy in the coming months. RSVP: RSVP is required. Follow this link to RSVP online: http://www.meetup.com/chinese-medicine-los-angeles/calendar/14653023/ You can also call 323-540-4180. Limited to 15 guests. Admission: $25. Includes food, recipes and handouts. Vicky Valencia is a holistic chef who received her training from the Kushi Institute, a renowned macrobiotic educational and healing center in Western Massachusetts. She privately cooks and teaches in Los Angeles, Las Vegas, and Mexico City on how to eat and live for the purpose of health, longevity, and well being. Vicky strongly believes that healing cuisine and gentle exercise have the ability to heal the body, mind, and spirit. She strives to share this simple wisdom wherever she goes. Henry Jun Wah Lee, L.Ac. is a Physician of Chinese Medicine, Licensed Acupuncturist, Medical Qigong instructor and Eastern Nutritionist. He has a private practice in Pasadena and Los Angeles, California. He offers regular public lectures on the benefits of Chinese Medicine to increase public awareness and to empower individuals to become active participants in their own health and wellness.